SELF-Esteem and The SELF-Published Author: Ending The Struggle Against YourSELF. This appeared originally on Writing It Real.com. Please go check out Sheila Bender's amazing site for writers! As my boots clicked against the worn parquet floor of Alumni Hall, I wondered, as I always do when I arrive at author events, if I was dressed right or if I should have put on some lipstick or mascara. A cold self-consciousness gathered in my belly and curled up and around to my spine as I continued the journey down the long hallway. Dim lights from antique wall sconces provided an ethereal glow, almost like I was walking through a misty forest. I paused for a moment and shifted the box I held under one arm, and then, with the other arm, I attempted– but failed– to shrug the strap of my leather purse into a more comfortable position, as it was digging sharply into my shoulder. I shivered with nerves, like a trembling, wet dog after a bath. I clicked a few more steps and reached a doorway, the sounds of laughter and talking tinkled like wind chimes. Despite my nerves, I readjusted the box against my hip, and paused again. I closed my eyes while doing a few “belly breaths” I learned in a yoga class. Inhale while pushing your belly out. Exhale while pulling it back in. Inhale. Push out. Exhale. Pull in. After a few moments, I still felt cold, but the ice in my stomach and back melted a bit. I took one more deep breath in and out. Then, I stepped into the room. My eyes traveled over a group that I might see in the downtown Bristol café where I do most of my writing. The crowd before me was a mix of ages, shapes, and sizes, and all were dressed casually or semi-casually in jeans and khakis, with a few of the women in simple, one-color dresses and skirts. Some people sat in dark wood chairs around an enormous library table. Other people milled about the room, talking or eating tiny pastries on paper napkins or sipping from glass mugs of what looked like apple cider. Purses and notebooks took up the few remaining empty chairs that rested against the mahogany walls. Walls that had high shelves filled with leather bound books and prominent busts of Catholic scholars and priests. A huge, rectangular oriental rug lay under the table in shades of green, navy, and maroon, and flowing drapes of the same colors hung in the long, narrow windows. As I walked a few more steps inside, I thanked myself silently for not wearing the navy business suit and heels I had packed; gray pants with a light blue wool poncho over a black shirt made for the right combination of casual, intelligent, yet “artsy”. The sounds of noisy animated chatter and smells of cinnamon and coffee washed over me, like gentle ocean waves lapping the shoreline. Since not everyone was seated at the table, I took that as a sign that the Celebration Of Authors Night hadn’t begun. So I followed my nose towards another smell–a smell that reminded me of the fudge shop next to my favorite café in Bristol. I weaved through the crowd, pausing for an occasional smile and hello, and wondered self-consciously if anyone thought I wasn’t just a young woman interested in a round-table discussion with local, award-winning authors. Does anyone know that I am, in fact, one of those award-winning, local authors? My guess was probably not. I continued towards the origin of the fantastic fudge-shop smell and tried to ignore more anxious thoughts that prompted another re-icing in my stomach. I stopped at the doorway to an adjacent room, readjusted the digging-into-my-shoulder purse strap. Before me was a table with several large, steaming carafes; half a dozen white mugs and clear mugs; a pile of tea bags in a small wicker basket; and a large platter of small chocolate-drizzled pastries. I knew balancing the purse, books, and a cup of tea would be impossible. So I looked around for a place to temporarily park my items. People grabbed tiny pastries and cups of tea and cider and eyed me with curiosity. And as those eyes scanned me up and down, I felt back in middle school with Ms. Perfect Popular and crew eyeing me up and down on the first day of sixth grade when I wore an “imposter” brand-name outfit. It was the same Espirit outfit as Ms. Perfect Popular but mine was from K-Mart. By lunch time, little drawings of me had been past around with the word “poser” at the top, and Ms. Perfect Popular pointed and laughed at me all through lunch while I sat with my two other friends and ate peanut butter and jelly, my head hanging in shame. How could they tell, I wondered? As I put the box of books and my purse down near the wood-paneled wall, I wondered almost the same thing, can they tell? I snatched a small, white mug. Can they tell I am not a regular author but a self-published one? I downed a cup of decaf coffee, which did little to melt the now re-emerged iciness and instead created a sort of crackle feeling inside that reminded me of when I pour hot coffee over ice for an impromptu iced coffee and hear a crackle, snap sound. I swear my stomach made the same noise, as the hot coffee hit my stomach. I heaved my box of books back up to my hip, balancing it like I do my twenty-one month-old daughter, then grabbed my purse from the floor and let it dangle off my wrist. I tried to tell m myself I was being ridiculous and that there was no need to feel anxious, yet, I hesitated before beginning the short journey back to the library room. The icy tension solidified completely as I realized that I didn’t know what to do with the box of books. I paused like the freeze frame in a movie, convinced that, by now, everyone could tell I was an imposter. Obsessive thoughts chugged into my brain like a far away train. Chug, I bet am the only self-published author here. Chug, chug, I don’t see anyone else with a box of books. Chug, chug, chug–. My thoughts paused at the top of a long steep mountain. As the train ascended, the thoughts blared like a train horn, gaining in speed and volume in my mind: Where’s the bookseller? Where should I put my box of books? How will I do the accounting if I leave the books with the bookseller? How do we handle the money? Will anyone even buy my book? Will the other author’s be able to tell it’s self-published? Despite the fact that these questions pop into my mind before or during almost every author event, that night, I actually felt panicked about it. Then my thoughts smashed and collided like a train wreck. After the smoke cleared, I flashed to an event I attended a long time ago, only four months into my career as an author. Prior to any event, the host will call and tell the authors if they will be signing books or speaking on a panel and if other authors will be there. In the case with self-published authors, the host discuss whether or not they can purchase books from you or order them from a distributor or if you need to bring the books yourself. For that event, there was going to be a mix of self-published and traditionally published authors. I was asked to bring my own books and do my own accounting. None of this bothered me or surprised me. The event was purely a signing and each author would have his or her own table. But when I got there, an old gray-haired woman with a name tag that simply read ”bookseller” instructed me that I was to bring my box of books, “Over there”. She pointed to a small round table with several forlorn looking people, holding or unpacking boxes of books. Not too long after, I huddled with those same people–all self-published authors–around the too-small-to-fit our books table. We were like the uncool kids squished into the geek table in the lunch room, eating our bland home made sandwiches while the cool kids drank soda and ate pizza or chicken nuggets, sitting casually on the table and not the chairs. We were the kids who wore the headgear to school and had thick glasses that slid down our noses. And the day simply proved how undesirable we were as us self-published geeks; we sold nothing and wound up trading each others books and spending a lot of time looking dejectedly at the old lady bookseller with the large rectangular table of books by authors. The traditionally published sect did their signing for the first hour and then was free to mingle, eat tiny quiches, and drink wine all the while Ms. Bookseller sold book after book. The self-published bunch shared a plate of cookies and took turns going to the bar for sodas. While most events I attend do not make me feel ostracized for being self-published and based on my book sales, honors and awards, reader emails, and now-agented status, I know that my success has proven that self-published authors can be as successful as regular, traditionally published authors. That we can sit at the lunch table with the cool kids and still eat our homemade lunches and be popular and interesting. After all, the authors of Legally Blond and Eragon, began as self-published geeks and are cooler than ever now. Yet, I there I was frozen in anxiety about being self-published, thinking back to the only time in the last year and a half when I felt being self-published might be a problem. Maybe it was just nerves about being on a panel with famous, mainstream authors. Maybe it was just PMS. But, looking back at that night, I think maybe it was something else. Maybe it was because of what would happen a few weeks after this event. Maybe I sensed something. Maybe I knew that things had been going way too smoothly for me–especially being self-published, a geeky, underdog in the industry. What would later send me into a real panic, happened several weeks after the Celebration of Authors. It would involve something from earlier this year, when I created a proposal for a yearly conference for the professional author’s organization I belong to–one which allows both mainstream authors and self-published to be members. My proposal was for a workshop about Successful Self-Publishing and I wanted to focus on how self-publishing has been a vehicle for me to arrive, hopefully, at mainstream publishing. I wanted to focus on my process and the steps I took that led me to an agent–my innovative marketing, which included teaching and speaking. I wanted to share what I had discovered about self-publishing. I received the rejection via email a month after the Celebration of Authors. A month after the panic attack/flashback to the horrible event with Ms. Bookseller and the self-published geek table. I was not surprised or upset by the rejection, years and years of rejection will help authors form firm calluses to the pain of being told “no”. What caused me to feel back in ice-land wasn’t the rejection itself, and it wasn’t even that the email was a boilerplate that didn’t have the correct author’s name inserted. “Catherine,” it began. The part that made my scalp tingle like the hair was about to stick straight up like a scared cat was what came next: “Although self-publishing is a viable option which is growing in popularity, as an organization BLEEP feels it is important to show support for traditional publishers.” My first reaction of course was who is Catherine and is she being rejected for the same thing? My second reaction was to think back to this event, A Celebration of Authors. To how the night was one of premonition and ironic success, ironic only now, sitting with the rejection email. So, one month prior to receiving the rejection that would forever remind me of the stigma of being self-published, there I was, at author event, my body still seized in a fit of cold anxiety, remembering Ms. Bookseller and the small table and the terrible, stale cookies we munched on while we tried to convince each other the night was still a success even though none of us sold a thing. I knew the anxiety I felt had to do with being self-published but couldn’t really isolate what it was specifically about being self published that caused this anxiety attack. After all, nothing happened yet. There wasn’t a terrible bookseller or small table. I just arrived. Suddenly, mid-panic attack, and before I had any more time to ponder my anxiety and flashback, suddenly, I heard a sing-song voice call, “Hannah! You must be Hannah!” I came out of the fog of thoughts and managed to move my eyes towards the sound of the voice. A gray-haired woman, about my height, with clear bright eyes and the kind of smile that reminded me of when I was the new girl in elementary school and out of the crowd of snarling eight and nine year olds, one girl grinned so effortlessly at me I couldn’t help but smile back and feel welcomed. This woman was that girl in this moment: “Oh, let me help you.” She reached for my purse and then touched the box of books. “Let’s give those to–Oh, pardon me! I’m such an idiot. I’m so sorry. 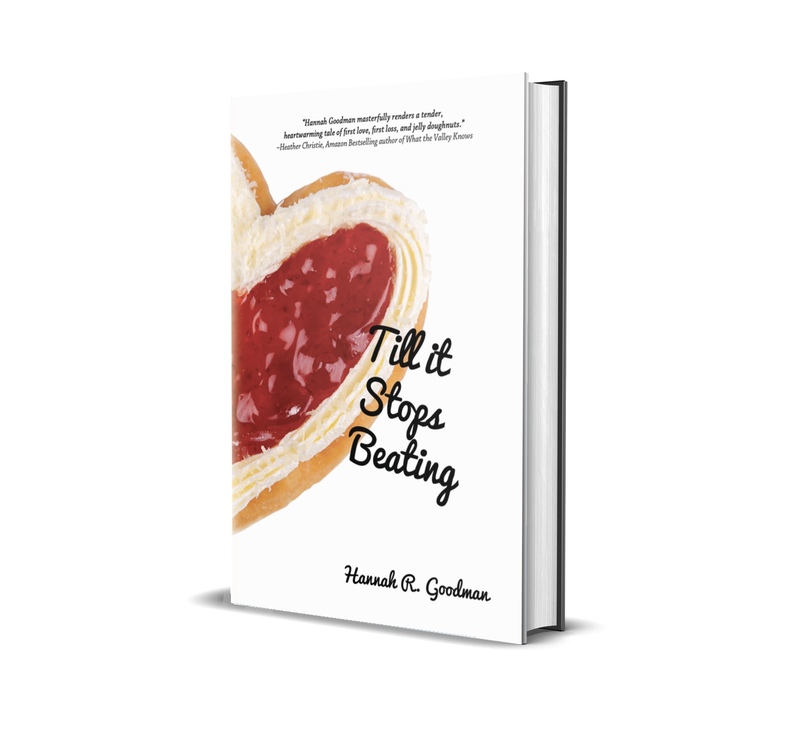 Hannah, Hannah Goodman, this is Mary.” A shorter blond haired woman appeared next to me, and as I turned to look at her I realized that when I hustled through to the room, I missed the table of books in the corner¬–a large table. Mary extended a hand and we shook like old friends. “I’m the bookseller.” Mary’s smile was that of a kind librarian or teacher, trying to help out the shy children. The next few moments were a brief exchange of my books and a reassurance that she would indeed collect the money and settle up with me at the end of the night. It was all effortless. Things happened so quickly that all that anticipatory anxiety disappeared. Little did I know, that same feeling would return one month later. Soon after saying goodbye to the bookseller Mary, Darlene guided me to a vacant seat in the stately library room with the comfortable looking readers and writers seated around the long table. Just before we began, I looked to the right and left of myself and realized I was seated next two internationally known authors. The feel-good warmth that had replaced the icy anxiety in my body started to cool off, as if an air conditioner had been turned on inside me. The obsessive-thought train chugged in: They didn’t have to pay for it. They are good enough and you are not. They are wanted, sought after, worth paying a sum of money for and you my self-published idiot are not. But just as quickly as it came, it chugged out when I looked to my left and a gray-haired woman with a gentle smile extended her hand and said, “You’re Hannah. I recognize you from your picture.” And with that she produced a copy of my book and turned it over to reveal the picture of me that I slapped on the book in desperation–me in frosted hair in a black dress about to chaperone the Senior prom at the school where I taught at the time. “I just loved your book,” she gushed. “Could you sign my copy?” I couldn’t help but glance over at the two “regular” authors, who had actually stopped their intense conversation with each other and were smiling at me. I signed the woman’s book and thanked her over and over. Then I turned back to the supposedly real authors and smiled back, “Hi,” I forced the word. 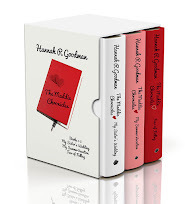 “I’m Hannah.” As I extended my hand, I forgot my self-consciousness and anxiety and remembered that my intention when I decided to publish my book was to connect and share–not impress people with sales, awards, or agents. I didn’t have time to chat it up with Mr. and Mrs. Regular Published authors as Darlene announced the panel discussion would begin. She asked us each to tell a bit about ourselves and also to read a bit from our books. Warmed by my “fan”, I skated through this part effortlessly. Then, when Darlene asked the audience if they had any questions, someone raised their hand and requested the, “how you broke into publishing” story from each of us. The two established authors seated next to me went first. They both told how they just “fell into” writing. So-and-so discovered me at such-and-such writing conference where I didn’t even bring a full manuscript one of them said with a teacher’s pet grin. And the other rolled his/her eyes in mock self-deprecation: I didn’t know what I was doing. I just sent a bunch of stories out to some magazines¬–magazines lying around the house. Magazines I don’t even read! Ha, ha, ha. and the next thing you knew, I had a New York Times best seller. I smiled along with the rest of the room but inside my started to freeze again. I squirmed and tried to will my stomach to melt and hoped I didn’t show any sign of feeling inferior and self-conscious. I quickly shoved my hands in my lap to avoid chomping on my cuticles. Hearing how effortlessly they each fell into there careers–the very same career I’ve been wearing down my knuckles over made me want to pull at my cuticles till they bled but instead I sat on my hands and smiled at my fellow authors till it hurt. Then, it was my turn and with a wobbly smile, I opened my mouth. Maybe it was a hidden pride that propelled me to share with the group my story, a story I tried to rush through at other events. A story that shows determination and tenacity. All I know is once I finished, I felt like the room should get up and give me a standing ovation. Additionally, while these mainstream authors seemed to have an effortless journey to publishing, they each still had struggles all writers face. One author spoke about rewriting: “Sometimes I rewrite a paragraph fifteen times and then windup throwing it out. That hurts.” and, another discussed making a living not off his books but writing for magazines. What I finally heard tonight was the harsh reality that being an author is a hard–hard for everyone, no matter your publisher, no matter your agent, no matter how you were published. By the end of the night, after we broke for book signing and more goodies and coffee, I actually felt a kinship with the other authors. We each had different paths to publishing, but the end result was similar. We all had to teach or write for publications to supplement the paltry income from book sales, and we all struggled with new ideas and writing roadblocks. Now I understood that this may be a hard business for some to get into, but it’s a challenge for us all to stay and it’s a challenge for all of us to feel good all the time. Later, when I pulled out of the long, narrow driveway of the alumni hall and drove through the quiet, dark campus, my body felt warm and lose. As I gripped the steering wheel of my SUV and tried to figure out if it was a left or right out of the college to get back to my hotel. The realization that no matter if I have a good or bad experience at an author event, I can do this again. I can self-publish my next book, why not? Why wait? What’s the big deal? Once the publishing part is out of the way, all authors’ experience the same hurtles and pitfalls–selling books, landing speaking and signing gigs, trying to make a living off what they love to do. We are all the same. Just trying to tell and sell our stories. Trying to balance the part we love with the parts we have to do to survive. As I drove out of the long drive and saw stars pop out of the midnight sky one by one I exhaled long and deep. A month later, I was sitting in front of my computer, desperate to drum up some of that loose warm feeling again. Desperate to remember my revelation in the car ride home and frightened about the prospect that maybe I had it all wrong. With the email now printed and in my hand, I oddly thought about how I felt like I do during Christmas time when every one says Merry Christmas and I want to scream, but I’m Jewish moron. Not everyone was born into the majority. The same thought over came me, I cannot do anything about being self-published its like my race and ethnicity, it’s part of me and this email, my God this email feels like discrimination. I thought about the entire year and half of being self-published how in so many ways it was like being the geek in school or the only Jew in a land of non-Jews. What I chose to do next, surprised me. I like to fit in and have felt for most of my life the struggle to fit but still be true to myself. I was both popular and geeky in school and while in the end it was the best way to be, I also never got asked to prom and was never voted “best” whatever. Secretly, I wanted both and still am a geek. So I never rocked the boat not with schoolmates or anything. But I chose to rock the boat that moment. And rock it I did. I sent out an email to the forum for the organization that relayed the email-rejection and posed a simply question: what do you all make of this? What followed that email is changed my perception of what it means to me to be self-published. Here I am sitting and typing this essay about being self-published and it’s been over a week since I sent out the email to the forum and the emails are flooding my in box. Some are on-list but over twenty-five are off list and personal. Some are from other self-published authors, many are not. Very few defend the letter and many urge me to do my own workshop without the support of– as one person put it– an organization that doesn’t support all members equally. What’s happened on the list is a huge almost-debate–that at times is a little nasty– about the legitimacy of self-publishing and whether or not the organization is discriminating against the self-published sect of membership. The fact that debate is now alive and doesn’t show signs of slowing down makes me realize not only the power of being self-published but also the power of me. This boosts my self-esteem a bit. I think back to the horrible event with Ms. Bookseller and the table of self-published geeks and I think back to the time when I was ostracized for wearing the imposture outfit, and I think back to the celebration of authors. I try to put it all together in my mind. What does this all mean? It means two things: first, that like my supposed “poser” outfit, self-publishing is just an alternative to the mainstream or “popular” way of doing something. The only difference between my outfit and Ms. Popular’s was that mine cost less and didn’t have a designer label. And, the only difference between my book and Ms. Regular Published’s book, involves the same two things–money and labels. It also shows me that just because something is mainstream, conventional, common, doesn’t make it RIGHT (or WRONG) and doesn’t make it BETTER (or WORSE). After all, the celebration of authors’ night was all about a level playing field for all authors. When we all sat together and talked about our journeys, there were more similarities than differences. Yet, I have a nagging feeling inside about that email. Was I really ostracized for not doing the mainstream, conventional thing? For being self-published? The nagging feeling is sadness about the way “self-published” is perceived by people in the writing industry. When I received that email, I had felt punched in the mouth, almost like someone hurled a racial slur at me. I had equated “self-published” with “Jewish”. Why? It doesn’t make sense to me as I sit here and type this. Self-publishing is not the same kind of label that Jewish is. Jewish, black, white, or Christian are labels that hold sacred meaning. Labels for parts of our identity that have made us feel scared or self-conscious when our label is the minority. Labels that have caused wars. Self-published should NOT be in the same category. People should not be threatened by it and yet it seems to be happening. Self-publishing is PART of what I do, as a writer–in the same way that entering contests, acquiring an agent, or attending workshops is part of what I do as a writer. Self-publishing IS NOT my identity or “who I am”. If you are a writer, I believe that the things you care most about are the process of writing and the reward of sharing your work. Isn’t self-publishing simply another means to an end? The “end” being sharing our work with the world and the “means” simply the “vehicle” which we use? Self-publishing isn’t a right or wrong it’s just another way to get your work out. It should not be something to discriminate against as it is simply a means-to-an-end. The end being getting your work out to as many people as possible. And yet, I find myself struggling with it in the same way I struggled with my identity as a teenager. Was I a geek or cool? Or the way I sometimes struggle with my Jewish identity. Is it okay to be Jewish? So in a sense this struggle with self-publishing has become a struggle with myself when really, it shouldn’t. It shouldn’t because when I began the process of getting my book published, I saw self-publishing as a tool and now it has become a label, a way of identifying my work, a way of identifying me. I thought I stopped struggling with labels and identity back when I graduated from high school. But I realize that this kind of struggle never really goes away completely because even when you don’t label yourself, other people will. But, it is this very struggle that propelled me to write when I was a teenager. This struggle fueled my writing and made me create authentic and self-conscious teenage characters. I owe a lot to this struggle. And I owe a lot to the struggle over the last year and a half. Even when I do get the big book contract and am in traditional publishers hands, I won’t forget this struggle. A struggle to feel good enough, a struggle to prove myself, and a struggle to bring readers a good story.